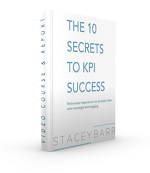 In the article “Why 8 Weeks For a KPI Project?” I suggested that when you’re using a new performance measurement methodology, like the PuMP Blueprint, your first few implementations will have more success if they are quick, focused and allow for unlearning of bad KPI habits. The theme of Week 1 is to plan your Performance Measure Blueprint project by choosing just a few goals or objectives to start with, forming your Measures Team and laying out the logistics for the next 7 weeks. The PuMP Mind Map activity is a great way to help your Measures Team to feel more confident that performance measurement can really work this time! The theme of Week 2 is to decide which specific results are worth measuring. The way we typically write goals or objectives is a huge hindrance in measuring them meaningfully. So we need a fundamental change in the language we use in writing strategy. We use the PuMP Results Mapping technique to make the goals or objectives easier to measure, communicate and cascade throughout the organisation. The theme of Week 3 is to design measures that give the best evidence of those results you decided were most worth measuring in Week 2. Avoid brainstorming, avoid limiting measures to the data you already have, avoid measuring what you’ve always measured, avoid hiring consultants to tell you what to measure. These approaches don’t produce good measures or good buy-in. We use the practical five-step PuMP Measure Design template instead. The theme of Week 4 is to hold the space for the broader circle of stakeholders to engage with the measures. Not everyone gets to be actively involved in the selection and development of performance measures, but they need to feel ownership of the measures that will impact them, or which they will have an impact on. We use a great method called a PuMP Measure Gallery, which makes it easy and fun for lots of people to contribute to the development of the measures that truly matter. The theme of Week 5 is to define the operational details of your performance measures to make it clear how to implement them (or bring them to life, as I like to say). For each measure, you need to formulate how it is calculated, identify the data you need, and define several other important aspects that will essentially constitute the action plan to make sure the right thing is measured in the right way. We use the PuMP Measure Definition technique to gradually build a Corporate Performance Measure Dictionary. The theme of Week 6 is to design graphs and reports or dashboards that facilitate valid interpretation of the measures and their use in decision making. For example, use line charts for trend information, use bar charts for comparisons between segments or categories, use Pareto charts to focus on the biggest reasons or causes. Reports need to contain all the information that the audience needs to understand the context of the measures, how to interpret what the measures are saying, and how to respond to what the measures are saying. We follow the PuMP Reporting Measures technique, which provides guidelines for the structure, content, formatting, and graph design for useful and usable performance reports. The theme of Week 7 is to start looking at your performance data in a new way, a way that ensures you get the most insight from your performance measures and don’t waste time chasing problems that aren’t there, or missing problems that are there. No more this-month-to-last-month and this-month-to-target comparisons! Fix the root causes of performance results (getting deeper than the symptoms), set performance targets that encourage continual improvement, and link the improvement cycle back to the planning cycle. We use the PuMP Using Measures technique to respond to the true signals in performance measures. Lots of people don’t realise that performance measurement is as disciplined as this, or that each of the PuMP Blueprint steps directly improve the impact that performance measures can have on your organisation’s performance. Performance measurement needs to be a natural part of doing business, but it won’t be natural until the steps are embedded into other management processes like planning, reporting, decision-making and process improvement. This means embedding the PuMP techniques into the appropriate processes so better measurement is automatic. 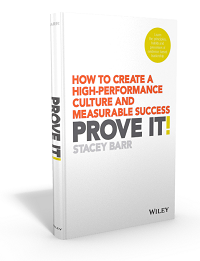 TAKE ACTION: Take a closer look at your performance measurement process. Can you flowchart it, or is it too adhoc? If you can flowchart it, where does it work well and where should it be improved? Rehearse a new approach using these 8 steps. If you want more help and more detail, the PuMP Blueprint Online Program can guide you with lessons, templates, examples and implementation instructions.